Kemba Walker deserved more media coverage. Before we move on to the 2011-2012 College Hoops season, we are paying homage to one of the most unique Final Fours in recent history. We may never see this collection of teams again for the final weekend of college basketball. 1. Coaches wear goofy looking Hawaiian shirts. 2. Teams win games despite shooting 35% and turning the ball over 15 times only because the other team can’t buy a shot in the second half. 3. Games air on ESPN2 at 11 PM CST and these games DON’T include St. Mary’s or Gonzaga. That is essentially the first couple weeks of college basketball in November. Before I start to blabber about the 2011-2012 season, I ought to bring some closure to the last memory of the past season. We watched a ridiculously painful National Championship game that everybody chose to forget due to dreadful shooting. The game resembled a November matchup in Maui, not a game to crown the champion but it topped off an unexpected set of matchups in the Final Four. My buddy texted me today during our annual college basketball pool draft asking me about the teams that made the final four last year – Uconn over Kentucky and Butler over VCU. His response: “I can’t believe I forgot that group of teams.” The best seed was a #3 who ended up taking the title. It was a unique set of teams and we may not see such a high seeded final four for at least another decade. With no further ado, here are my finishing thoughts on the final four teams before I start ranting about the new season and have existential regrets of my life for caring too much about Bruce Weber and Illinois basketball. Some “experts” say that the NCAA is only a few years away from expanding the tournament to 96 teams. Most college hoops purists would erupt at that thought but nobody made a better argument for the expansion than Shaka Smart’s team. Nobody will remember the Tuesday games between VCU/USC and UAB/Clemson. UAB and USC didn’t even seem to care about these games. They were just mad to travel and play an extra game after their season ended. About 2000 fans showed up for these games and it was worse than NIT matchup. However, all the pro-Boise folks would make the argument that every team deserves a chance to make it to the final four in a tournament setting. Thank you VCU. We are a couple years away from printing our brackets in landscape format and using a magnifying glass to look at the team names in size seven fonts that are used to show all the 96 teams on one page. Having said all of that, the Rams were great for college hoops. They had a senior point guard who seemed like a pro in the college game. They had a potential NBA prospect, Jamie Skeen which didn’t hurt their matchups against more athletic teams. This is one of my theories which will be elaborated upon during this season – you can’t get to the final four without at least one NBA player on the squad. VCU played the best teams at each specific round during the tournament. Some might say they lucked out with Florida State but the Seminoles convincingly handled the traditionally overrated Fighting Irish of Notre Dame who were just happy to make it to the tournament for once after spending years on the bubble. The Rams did luck out a little bit with “Bucknell” Bill “Bradley” Self who for some reason has issues with Elite 8 games. Last week, ESPN essentially scripted Coach K’s 903rd win on air and set it up so it could be in the Madison Square Garden. Bobby Knight showed up to call the game and a bunch of ex-Dukies showed were in attendance. Everybody basically assumed that Michigan State would roll over and grant K his historic win on the big stage. They put up a fight for the most part but The Plumlee triplets were too much for Sparty. During the celebration, Coach K repeatedly brought up the 1986 team with Jay Bilas and Johnny Dawkins as the first team to break ground in his coaching career at Duke. Dawkins was the first McDonald’s All American to commit to Duke and Bilas was just a lean looking big guy who truly did go to Duke for academics. He later got a Law degree from the university so I believe that he cared about more than just basketball. What does all of this have to do with Butler??? 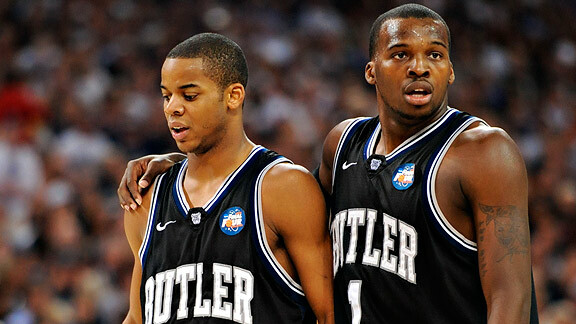 Mack and Nored will end up being key names in Butler's history. Shelvin Mack, Matt Howard and Ronald Nored … we might remember these names in a very significant way 20 years from now. Am I saying that Butler will be equivalent to Duke in 20 years?? Nope, that’s not my point. Will Butler be a force in the college scene IF Stevens stuck around?? Abso-freaking-lutely. If last year’s run didn’t prove that to us, then I am not sure what would. Yes, the non-believer will come out and say “Stevens needs to do with the next class of recruits.” Valid point for sure but his recruiting will only get better. Matt Howard wasn’t recruited by most schools b/c he looked like an awkward hippie who was forced to play basketball only because he grew to be 6’9. Shelvin Mack looked “slow” until you saw him drain one clutch 3 pointer after another. Ronald Nored? This guy signifies Stevens’ philosophy better than any other player. He never looks for his shot and is a bulldog (no pun intended) against the best player on the other team. You want a list of other All American guards he shut down last year? Ashton Gibbs and Brad Wannamaker from Pitt. Jordan Taylor of Wisconsin and the Kenny Boynton/Erving Walker combo from Florida. Those guards scored their averages but they had to earn every single bucket against Nored’s pesky defense. Butler’s performance in the NC game totally wiped out their impressive run leading up to it. Stevens won every game in which his team was not outmatched athletically. Old Dominion is a rugged team who don’t overpower you with size or length. Pitt and Wisconsin have put out great seasons perennially but they do it using defense, not NBA talent. Florida has some athleticism but they possess something that Butler feasts on – inconsistency and lack of discipline. Stevens set up perfect game plans for his players to execute against every team with equal physical talent except for the final team who just had too much raw talent and combined it with 20 minutes of discipline – The Huskies. Before we get to UConn, I want to address the biggest misconception in all of college hoops: “Calipari can’t coach.” One of the main reasons behind my obsession of college hoops is that it humbles your bias as fan. If you are biased in this game, it’ll come to bite you … in terms of HUGE $$$ sometimes. Trust me on that one. I could have been the president of the “Calipari is only a recruiter” movement during his time at Memphis but I will take the exact opposite stance on his case after his last two seasons in Lexington. It is extremely tough to coach a bunch of talented 18 year old that have been told by everybody (parents, coaches, recruiters and agents) that they are only one year from buying Hummers in the NBA. The John Wall team overachieved in my opinion by making it to the Elite 8 but last year’s team was Calipari’s best work. The point guard domino chain was replaced with Brandon Knight and Terrance Jones was a perennial Calipari recruit. But he changed his game plan from the John Wall/Demarcus Cousins group within a few months. This team didn’t sprint up and down play an “unleashed” brand of basketball but they played a methodical half-court game. They consistently improved during the regular season and did the unthinkable during the tournament – make Jared Sullinger do something in the paint other than just backing his ! @# in to dunk the ball. It is unfortunate that one name will be lost amongst all of the Kentucky’s college all-stars: Josh Harrelson. His defense against Sullinger in the Sweet 16 game is analogous to stopping Shaq in the NBA playoffs between 2000 and 2003 when he weighed 350 lbs. There is only one issue with that analogy … nobody in the NBA could stop Shaq during that period. Harrelson held his ground and forced Sully to show some post moves. Kudos to Charles Barkley for calling out Sullinger’s lack of post moves after the first tournament game. On a side note, I thought the Barkley/EJ/Kenny crew was just fine during the tourney coverage. The ironic part of Kentucky’s run last year was that they did it with some upperclassmen that were almost forced out of the program to make room for more All Americans. DeAndre Liggins was clutch and Brandon Knight was clearly the best freshman guard last year … not Harrison Barnes. Now he wasn’t the best guard in the country. Mr. Walker made left no doubts about that. “Teach me how to Jimmer” swept the country on YouTube. There were Facebook groups with half a million followers dedicated to Jimmer Fredette. What he did for college hoops last year deserves a whole another post but the excessive media coverage did hurt Kemba Walker’s work last year. Once again, the poor NC game performance shortened the post-game respects that this UConn team deserved. Kemba broke down every guard offensively and he was a true leader on the court with a bunch of freshman. There were constant comparisons to the Jerry McNamara led Syracuse team from a few years ago but most hoops followers including myself forgot about one key difference. Walker’s game was much more versatile than McNamara. Walker introduced himself as a slashing guard with no jump shot in UConn’s 2009 final four run. But he epitomized what player development represents in college hoops. He developed a pure jump shot during the offseason to become a force which added one more dimension to his game unlike McNamara who was a pure shooter. Kemba will surprise a few people in the NBA but there are a couple more folks who didn’t get enough credit after UConn’s title run. 1. Jim Calhoun. Calhoun’s recruiting troubles hurt his image leading up to March. Everybody forgot that this guy built a program with a bunch of mediocre players 90s. He had one good player at best e.g. Donyell Marshall or Ray Allen during that decade. His halftime adjustments against Butler in the final game reminded me of the 1999 final between Duke and UConn. Calhoun had one legit star on the team (Rip Hamilton) but he created a perfect game plan to take down a Duke team with three NBA starters (Elton Brand, Corey Maggette and Shane Battier). Calhoun buckled down for 20 minutes and showed what he used to capable of during every single game in his heyday. Truth be told, his teams underachieved over the past few seasons but he took a group of raw freshmen talent to the title last year. 2. The UConn Freshmen. 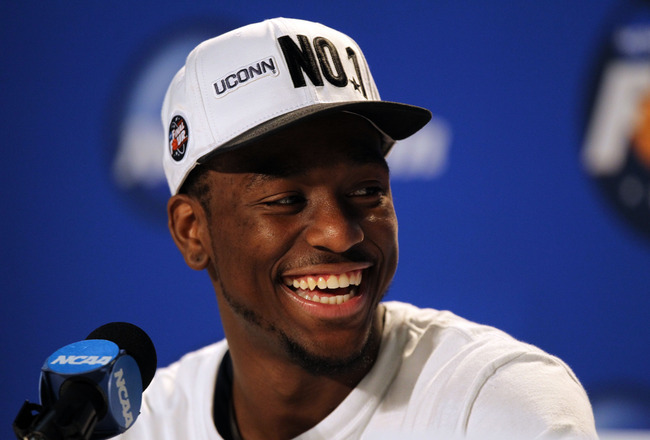 Kentucky’s freshmen received all the publicity but the UConn kids are something special. Jay Bilas will rave about Jeremy Lamb’s wingspan in about one year on NBA draft day but he fit the best role of a defensive stopper during the tournament run. His role is analogous to Ronald Nored’s defensive genius form Butler. Shelvin Mack was truly puzzled for the first time in two seasons against Lamb’s defense. Shabazz Napier will have the spotlight to himself this season in the backcourt without Kemba. Alex Oriakhi gave Matt Howard fits in the pain with his strength. As I mentioned earlier, Butler beat every team that had equal physical talent compared to their players and feasted on the lack of discipline in the case of Florida. UConn was more talented but they also played a very structured and disciplined brand of basketball for 20 minutes and that was too much for Butler’s crew in the final game. Now, can this trio of freshmen (Napier, Lamb, and Oriakhi) continue to be disciplined this season? Only time will tell … I am glad college basketball is back again.